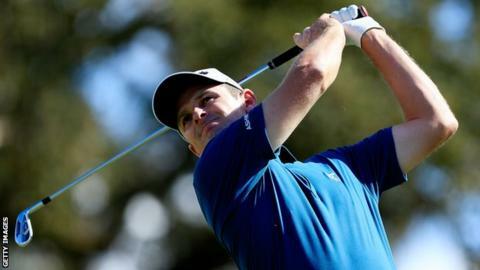 Justin Rose faltered as Argentina's Emiliano Grillo claimed his first PGA Tour title with a play-off victory at the Frys.com Open in California. Grillo, 23, was tied with America's Kevin Na on 15 under after a three-under 69 in his final round and won at the second extra hole with a birdie. Rose was 14 under after nine holes but three bogeys in his last six holes saw him finish on 12 under after a 72. Northern Ireland's Rory McIlroy carded a three-under 69 to finish nine under. This was an improvement on his previous two rounds of 71 but not enough to give the world number three a chance of challenging. Grillo, who had only earned his tour card two weeks ago by winning the second-tier Web.com Tour Championship, held his nerve superbly in the play-off with 32-year-old Na, putting his third shot to within 10 feet of the hole before sinking the putt for victory. The win earns him $1.08m (£700,000) and a place in the first major of 2016, the Masters in April. "Maybe we can play the tournaments we always wanted to play." Earlier, Grillo had moved to the top of the leaderboard after beginning the day two shots back, but Na, who birdied four of his last six holes, including a four on the par-five 18th, forced a play-off. The pair finished a shot ahead of Americans Justin Thomas (69) and Jason Bohn (70) and Tyrone van Aswegen of South Africa (68). Another South African, Charl Schwartzel, tied with Rose on 12 under, along with American duo Patrick Rodgers and Kyle Reifers. Brendan Steele, who led after 18, 36 and 54 holes, shot five bogeys in the last six holes for a four-over 76 and trailed home 17th.